“My parents never made it to school. They grew up in the school of life and taught themselves how to read. Even though they didn’t make it to school, they made sure that we did.” Gloria Esperanza Sosa, rural teacher in Honduras. Gloria Esperanza Sosa leans against local politician, Walter Chavez, after receiving a national award for teaching excellence by the Honduran Congress. Photo, courtesy of Walter Chavez’ Facebook page. Every morning, Gloria Esperanza Sosa gets up at 6 o’clock and heads to work. Gloria is a teacher and the school director of Jose Cecilio del Valle, a rural school in Las Crucitas, a small village of 100 homes in El Paraiso, Honduras. The school is located in a very small village in El Paraiso, Honduras. Las Crucitas is a village of 100 homes in Danil, a municipality of El Paraiso in Honduras. Gloria’s father was one of the original founders of the village. He and other rural families joined forces to build Las Crucitas’ first school. In fact, it was this school that gave birth to this community as rural families moved to the area so they could work and educate their children in the remote area. Today, Gloria describes her neighbors as members of a community that is “muy bonita,” very beautiful. She praises the families as healthy, and Las Crucitas as a place filled with good, hard-working people. Gloria is more than a teacher. She is a leader in a small farming community. Her students are the children of farmers. Packed with a good crop, Edwer Lagos, a tomato farmer heads to town for a good sale. Photo, courtesy of Melissa Lopez . The village is connected through dirt roads. Residents have access to potable water and electricity, innovations of the recent years. There is no plumbing or hot water. Melissa Lopez, daughter of Gloria Sosa, shared that their community is united, collaborative and extremely helpful. When she heard that I was interviewing her mother, Melissa contacted farmers across Las Crucitas asking for photos of every day life. “All I had to do was ask,” stated Melissa, “and using their little old cell phones, photos from across town, started pouring in. Famers were happy to help and to share picutres of their lives for Gloria’s story. Life in the farm in Las Crucitas. Photo courtesy, Melissa Lopez. Residents use latrines, and wood burning stoves to prepare their daily meals. Gloria considers herself blessed. She has one of the few gas stoves in the community. Gloria and a precious commodity, her gas stove; a luxury in the village. To buy food residents travel by bus to Danli, the nearest city. The bus is considered a long distance traveling treat. Locally, people get around on bikes, and homemade motor-taxis. Some residents build attachable baskets onto their bikes, and add a third wheel for easier transportation of goods and people. No alcohol is sold in Las Crucitas. It is an extremely religious town, mostly Catholic and evangelical. Catholics attend the church, Sagrada Familia, Sacred Family, and evangelicals attend Pentecostal International Mission. Melissa shared that since everyone in town knows each other, crime is extremely low and almost unheard of. People are so helpful that if I were to arrive in town and was lost, I could ask anyone how to get to Gloria or her daughter, Melissa’s house, and after interrogating me to make sure I’m a good person, they would guide me to their homes, and wait outside just in case I need anything else, like having to find another neighbor or needing to find my way back to a different town. There are 4 teachers in Las Crucitas, including Gloria. Women work hard. They are homemakers, and also work in the fields and help milk the cows. After milking the cows, women take the milk to milk factories and this helps them to make a little extra money for their families. Women also attend church regularly and men like to play soccer. Gloria catches a ride in a moto-taxi. Gloria stops to pose for a photo to highlight her story. Gloria is 65 years old. She has been teaching for 36 years, and presently, she teaches the children of her first cohort of students. I found Gloria when I stumbled upon a Honduran article on teaching excellence. In a photo celebrating her dedication to her community and to education, petite Gloria leaned against local political candidate, Walter Chavez, as she hanged on to an award recognizing her as an outstanding educator. After contacting Mr. Chavez, I was able to connect with Gloria and interview her. Amidst roosters’ yells, laughter, my Spanglish, and Gloria’s happy spirit, Gloria told me she had been waiting for my call. The teacher shared her views on education, the meaning of her award, and they way she hopes to be remembered by her students. Headed to school. A sunny day. Gloria grabs her vibrant umbrella and heads to work. A courteous neighbor drops Gloria off at the gates of her school. Photo courtesy, Eva Sosa–Posing, Gloria far left, in blue, all her students and some parents. Eva, Gloria’s sister, took this and the following photos of Gloria, her students and the family. Gracias, Eva! Mi name is Gloria Esperanza Sosa. I have been working as a teacher since the age of 22. I was “bien jovencita,” very young when I got started. I knew that I was meant to teach since a very young age. I knew this because I love children and I love to teach. I work in a rural area and through my lifetime as a teacher I have witnessed much poverty and many difficulties affecting my students’ families. I have always done what I could to support the children. Whatever they have needed, I have tried to provide it. Sometimes it’s been school supplies; other times, it’s been food, and help. I have raised so many youth! I am so grateful for my teaching award, and for the computer I received from the national congress. Last year, I was invited to apply for this award. I sent my curriculum, and to my surprise, a commission representing the municipality of Danil visited me to tell me I was going to be honored. Later, I received a call from Congress inviting me to attend the celebration. 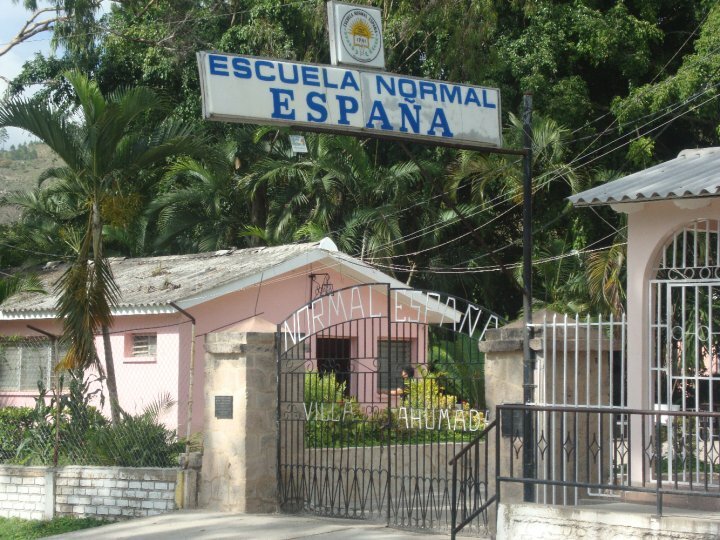 I trained to be a teacher in the Escuela Normal Espania in Danli, which continues to train teachers today. When I went to school, the teaching credential lasted 3 years. I have faced many challenges as a teacher. But one learns to adapt. Rural villages are not places of luxury. We don’t have much, but we do a lot with a little, and we know what matters. At the beginning of my career I didn’t have electricity, or potable water. Things are better now, but there is still work ahead. I had great parents who taught me to give of myself selflessly, to love my neighbor, to love children and to cherish the elderly. These teachings propelled me forward then, and continue to move me to action today. My job is to raise the next generation and to help shape their character. Academics are very important, but equally important is to teach children values. Some of the greatest challenges we face is that we cannot rely on economic support from our government to provide the type of quality education we would like to offer . I’m working on getting help to get a new roof for our school. The building is 36 years old and our roof is in immediate need of repair. When it rains, we have leaks. One of our classrooms, in particular, gets a lot of water. Our fence needs to be patched up, too. It has deteriorated over time. We need to repair it because it helps us to keep our students safe and our property protected. Our tables and school benches are very old, too. We have a united community and parents always step in to try to help. We hope to find furniture and service providers that can help our school. Our playground is an open ground. Children don’t need much. Just fresh air, and a big space. Our students use their imaginations to entertain themselves. They like chasing each other during break, jumping rope and playing hopscotch. Gloria’s students jump rope during break time. We have 96 students in our school and we teach all 6 grades from 1st to 6th grade. I am the school director and also its oldest teacher. I teach 3rd and 4th grade. Our students range in ages from six to twelve years old. Our day begins at 7 am. We stop for lunch at twelve and some days continue on until 3pm. We start our day with daily prayer, spiritual and moral teachings and then move on to natural sciences, Spanish, math and other courses. A Classroom in Gloria’s school. I wake up at 6 am. I head to school, go home for lunch, and return to school at 1pm. Due to scarcity of food, the families have asked that the children be allowed to walk home, eat with their families and return to school. I have allowed it. Our school does not have technology, computers or internet signal. But we do have electricity and water. The children are good children. They need more education after completing their schooling here, but while here, they apply themselves and they like to learn. We expose them to everything we can. Some love history, math, drawing and the arts. We don’t have a lot of discipline problems in our school. We find the time spent inculcating values, morality and love of your neighbor helps keep discipline problems at bay. Gloria and Her Students’ Parents. I write reports on our performance. I pray for the wellbeing of my school and oversee it’s welfare. Here, we have a good time. Work is enjoyable. The government hires our teachers. You take an exam, and then we fight for our jobs. To earn a job as a teacher entails education and stiff competition. We barely have any openings. Even when teachers want to work and are willing to go up the mountains, to remote villages, anywhere to work, there is still no work. We have many unemployed teachers. They become homemakers while they search and patiently wait for an opportunity to serve. We like to work hard and to have something to offer, even when we don’t make enough to survive and barely get by. Gloria and a student’s parent outside the school. We believe that students learn by doing, by solving problems, by research and group learning. My pedagogical style is to teach a lesson, followed by conversation with the students, and then we move to practice. There is value in learning by doing. I encourage them to investigate solutions. When they get stuck they work in groups to find answers, and I guide them, too. My goal is to inspire them to learn and pursue answers. I provide them with opportunities to practice what they learn, problem-solve and learn to search. I hope they never stop asking questions. The children don’t have much, but they are good children. They take pride in grooming themselves to come to school with their little uniforms and their one pair of dress shoes. The families live very close to one another. Only 3 or 4 children live about 2 kilometers away from school. The community is tranquil. We don’t have delinquency problems. Families work hard and receive sustenance depending on the seasons, the weather and the crops. The parents hope that their children will graduate and find work; that their lives will be easier and more prosperous than theirs. They want them to have a better economic, social and cultural life. We each teach approximately 30 students. After completing 6th grade those who can afford it transfer to a city school. They go to a school, Instituto de Union Oriente in Danli, Honduras. Not everyone can afford to go. The majority stays home, here locally. The boys will follow in their fathers’ footsteps and work in the fields. The girls will become homemakers. The city school is a public school, so families don’t have to pay monthly fees. The problem is the charge for transportation. The school is 6 kilometers from us. Few can afford to pay. “Prof, please find me a job?” I don’t have the means to help them with that. They graduate almost for nothing. There’s no work here. Honduras is Facing a Crisis of Unemployment, Especially in Our Rural Areas. There is so much poverty and scarce opportunity. Ours is an agricultural village. We used to raise cattle but not anymore. Those who work in the fields work hard for very little. The children who attend our school can only wish for the basics. Their fathers grow crops and their mothers are home makers. We raise corn and beans. The wealthiest families, only about 3 or 4, have a few livestock. People in our villages are humble, shy and respectful. But this doesn’t mean we don’t dream. Our families have goals, aspirations for their lives and the lives of their children. Before, no one could study beyond sixth grade. Now, we have most students completing primary school. Some are able to go to college and become professionals. Others, are still fighting to improve their lives. Life in the village is different than in the city. The main difference is opportunity. All of us Hondurans share the same love of culture for our country. But depending on where one lives, the rhythm of life changes. I am a daughter of farm workers. I grew up in a rural village close to Danli. When I was 7 my parents bought a little house here and sent me to school. I loved school, and went on to study to become a teacher. The students loved me so I decided to root myself in the community. I got married here and stayed. My father has passed away, but my mother is 93 years old. They were hard-working, dedicated people. They worked in agriculture and stockbreeding. We had great parents. I’m very grateful for them. Now my mother is very old, like a little girl, very dependent on us and we take care of her. I have three children, two of them are teachers. My parents never made it to school. They grew up in the school of life and taught themselves how to read. They didn’t make it to school but made sure that we did. It was important to them to raise us to have a spirit of solidarity. My parents expected me to help others, to be of service. We grew up with lots of love and above all, we were taught to love God. From them, I learned the value of perseverance and hard work. They taught us the importance to stay humble and to respect those who are different from us. Honduras is a beautiful country. It has many beautiful natural resources that sadly, have been exploited. In my opinion this is the most beautiful place on earth. We have to protect it. We used to have precious animals and flowers that man has exhausted. In chopping down so many of our trees, whole floral and animal families have grown extinct. Their homes are gone. It is a stunning place. 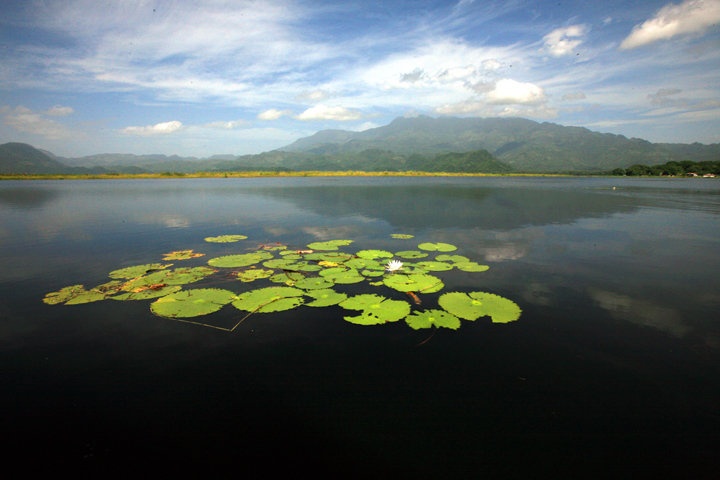 We have two oceans on each of our coasts and a beautiful lake, lago de Yojoa. Lago Yojoa, Honduras. Photo, Mundo Catracho BlogSpot. One of our favorite past times is to cook and eat with family and friends. We eat paletas, corn cakes with beans, rice and seasonal vegetables. When we can afford it, we add a little beef, chicken or pork. Our local families cannot afford to spend on entertainment. After a hard week of work, we like to stay home, go to church, rest. We take walks, clean our homes and do our chores. Sometimes, we watch tv, Christian television, soap operas, sports or cultural programs. Modernity is changing us. Machismo lingers on but it’s not our defining cultural trait. Parents continue to have the biggest impact in orienting the character of their children. Unfortunately, even with the best teachings, one cannot invent jobs. This is why we have such big immigration waves. Those who leave Honduras don’t leave because they want to. They have to. They want to protect their families. They want to work. Some go to Spain, some to other Latin American countries, some to the U.S. Many fail along the way, and many families are fractured and suffer long separations and hardship while relatives leave in search of work. The rise in single mothers and single fathers have to do with immigration flows, lack of work, and changes in the family. The single parent here is extra resourceful. Each day they have to recreate strategies to survive. How to bring the “pan de cada dia,” how to find the daily bread. Life pushes them to become entrepreneurial. They make and sell things. They do gigs for others. They clean homes, sell items, make items and exchange favors. They sell tamales. They do what they can. When our children get sick, we have a health center 20 kilometers from here, but it doesn’t do us much good. Mothers do what they can to come up with their own medicines. We do have one doctor working at the center but we don’t have medicine. Hospitals do not have medicine for us. The doctor writes a prescription, the mother puts it in her bag and figures her own way to heal her child. Do you want to know how we heal when we get sick? Well, through God’s providence (laughter), of course. Diosito is very busy in Honduras. Our God is very busy in Honduras. He gets called around the clock. The good news is that He is powerful and can do all things. We can retire at 50, but why stop? At sixty-five I still work and there’s so much work to do. I have started the process of retirement, but I’m not in a hurry to get there. Gloria and her family. Relaxing at home. Some of my ex-students are working as teachers, engineers and lawyers. I feel such deep joy that I had some impact in their upbringing. Over the years some of my students have returned for a visit and have told me, “Prof, I remember when you used to tell us to be kind and to be generous.” These visits make me smile. What I hope they remember is my little voice encouraging them along: Charge forward! Choose the right path, and choose wisely. Love your creator. Cherish your families and fight for their welfare.